One sure way to get kids to eat their vegetables is to hide them. And they won’t notice all the good stuff hidden inside this Kid Friendly Pasta Primavera. Sponsored by Heartland Pasta. When I see a new mom, I start to remember how naive I was before I had kids. My neighbor and I laugh at our former selves and how we used to judge other moms and their children crying at the supermarket or throwing a tantrum at a restaurant. Now, instead of giving glaring stares, we receive them! My husband often asks me when he gets home from work, why I don’t enforce certain rules: Why are the kids watching tv? Why aren’t the kids doing their homework? Why are the kids eating snacks at 5pm? I usually look at him with this exasperated look on my face, wave my white dish towel and explain that they have beaten me. I have to pick my battles. BUT, one of the battles that I refuse to back down on is getting the kids to eat their vegetables. I admit. I thought it would be easy. I eat vegetables. My husband eats vegetables. The baby ate the vegetables I gave them to him. Small retreat. Regroup. Begin again. Luckily, Kid #2 and Kid #3 were easier to work with. Middle Child will eat his vegetables as long as it’s in a soup. My Princess will eat salads, soups and practically any vegetable I give her. In fact, she proudly tells everyone that her favorite food is broccoli! So, I am left with my oldest, the Professor, who used to eat vegetables and then decided one day that he didn’t like them anymore. Like marinara sauce. He used to eat it, then when he was three years old he decided he didn’t like it anymore. But, I was still left with a dilemma: How do I get my kids to eat veggies? I decided it was time to get creative with my illustrious “pizza sauce.” I begin by sautéing onions, celery, carrots and sweet potatoes. Then I stir in broccoli, zucchini and garlic. 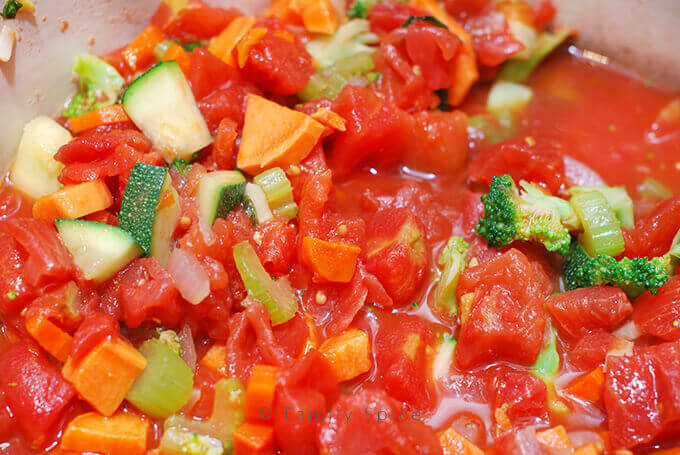 Once all of the veggies are fork tender, I stir in the tomatoes. And then I pulverize everything with my hand blender. Oh, where or where did those vegetables go? Now my kids are used to seeing “green stuff” in their pizza sauce, so I stir in the chopped spinach at the end. If your kdis are finicky, feel free to add it to the chunky veggies and purée everything together. So pizza sauce, aka My Kid Friendly Pasta Primavera was born. Serve it vegetarian-style or with some ground meat. Either way, it’s a family favorite and weekly menu item in my household. 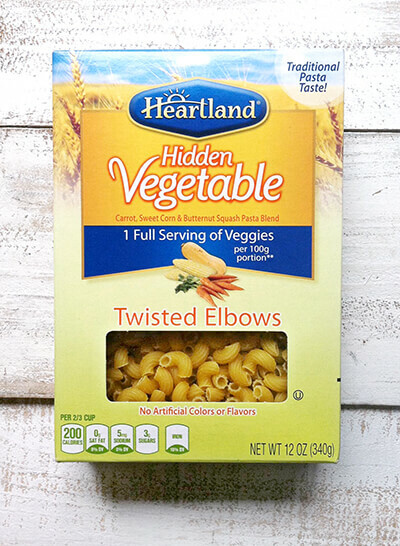 To make things even healthier, Heartland Pasta sent me some of their Hidden Vegetable Pasta to sample. 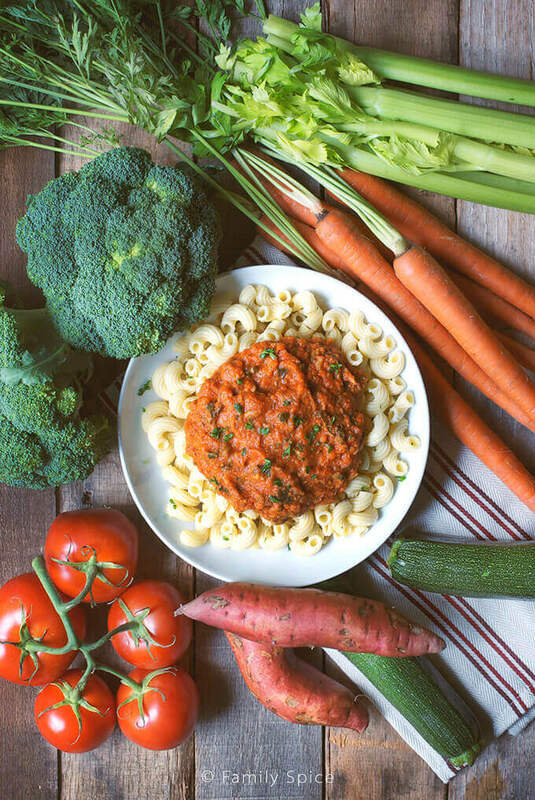 You will find 1 serving of vegetables in every 100 grams of pasta. More importantly, the pasta does not taste funny. I served it to my family, in secret, and no one noticed anything different about their dinner. Even my persnickety husband who notices everything in my cooking, texture, taste, color – not a peep. I fed the Hidden Vegetable Pasta to my daughter’s playmate – again, she gobbled it up. I ate it plain and I swear, I couldn’t tell any difference from Heartland’s Hidden Vegetable Pasta with regular pasta. If anything, the texture was more firm, and it didn’t turn to mush like ordinary pasta does. The Professor was happy that I had leftovers for a few days. After middle school, he comes home ravenous and he has enjoyed eating a small bowl of my Kid-Friendly Pasta Primavera served over a hidden extra serving of vegetables with the Heartland Hidden Vegetable Pasta. I think he got a month’s worth of vegetables that week. I wonder if that carries over for those bad days when he doesn’t eat any vegetables? Do you have veggie lovers in your house, or do your veggies need to go into stealth mode to get eaten? 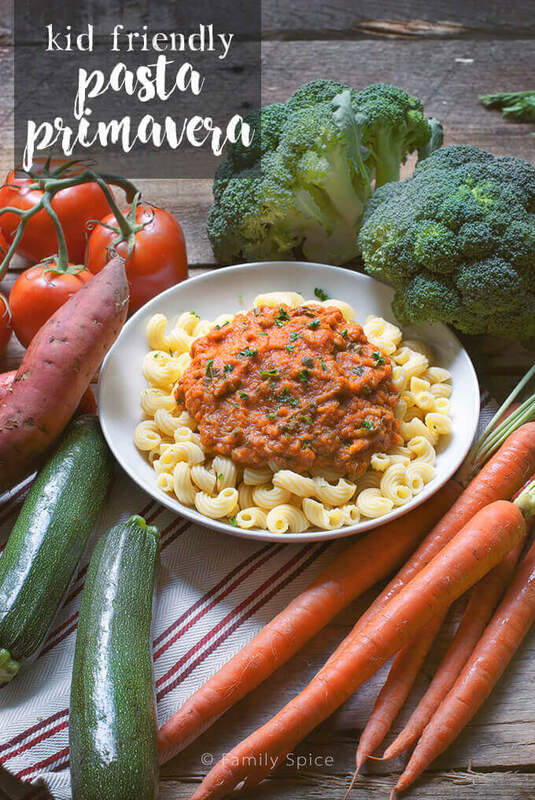 So while the kids are enjoying their veggie packed pasta, maybe Mom and Dad can enjoy kick back with a more grown up dinner and learn how to make vodka sauce for their own pasta? One sure way to get kids to eat their vegetables is to hide them. And they won't notice all the good stuff hidden inside this Kid Friendly Pasta Primavera. Reduce to simmer on low heat for 20 minutes. 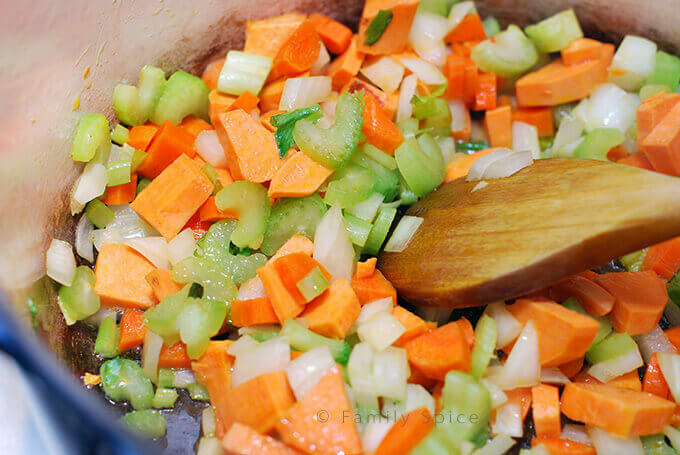 Vegetables should be soft, but not mushy. 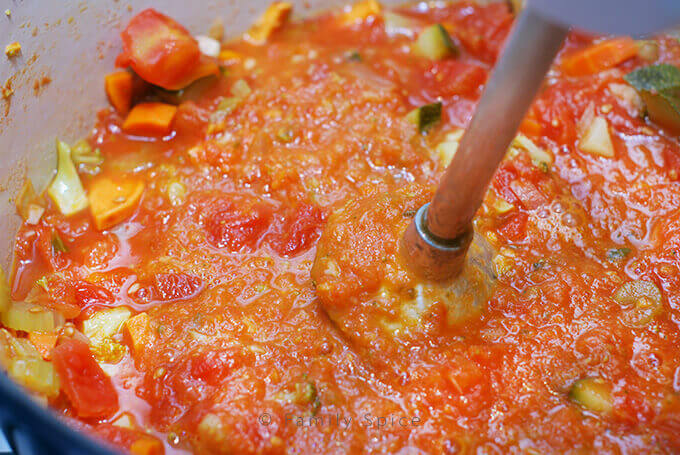 Using an immersion hand blender, blend vegetables until sauce is smooth or until desired consistency. 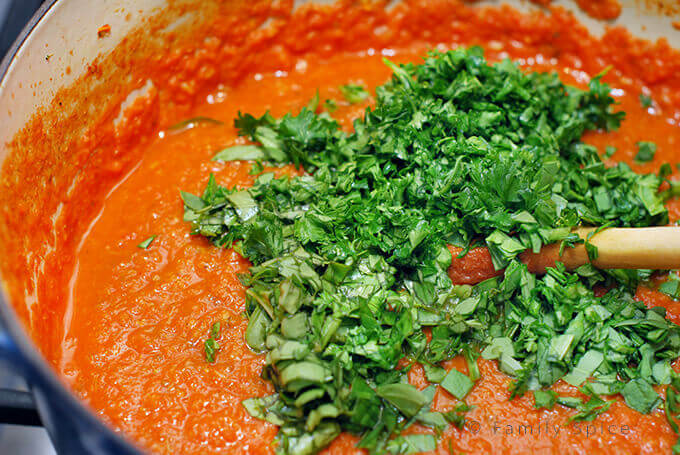 If you donʼt have an immersion blender, let sauce cool then purée in a food processor. Disclosure: I received samples of pasta and a stipend from Heartland Pasta. The story I have written is all true, and the opinions are truly mine. If I didn’t like it, I wouldn’t blog about it. Fun post. You have to outwit kids sometimes, don’t you? 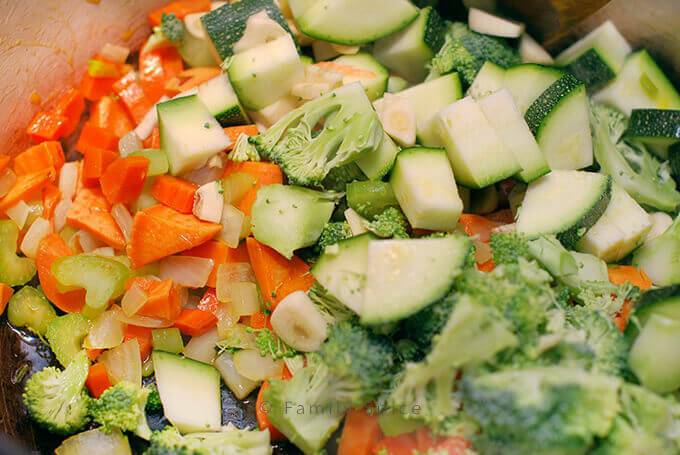 Great idea for sneaking veggies into dishes they already like! Good stuff – thanks. Where to find this pasta brand?? 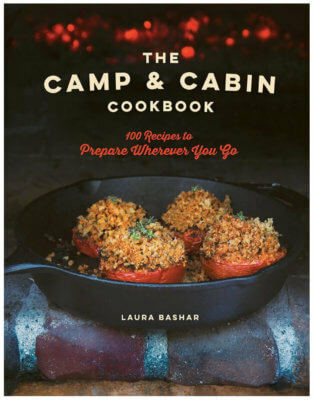 ooh I love this … I make marinara sauce with tomatoes, beets & carrots… but never added squash to it. Seems more hearty. Will try this , Thanks !! You have found a great solution. As long as they can’t see the vegetables, they don’t taste them. Interesting. This may be kid friendly, but it looks adult friendly too – I want to grab a fork and dig in! Great way to park veggies for kids who can’t get past the taste or texture. Hehee I love your story – it always make me smile because we’re going through similar life and can relate! 😀 My kids are pretty good with veggies, but I did work hard from their young age AND still working on certain veggies that they are hesitant to eat. We must be persistent! 😉 Great post, Laura!